The 2019 Zippo Collectible of the Year is here! To celebrate the 50th Anniversary of the Moon landing of Apollo 11 in 1969, Zippo have released this Limited Edition individually numbered Armor Zippo lighter. Finished in a unique sparkly Galaxy Stardust finish and featuring a deep carved Astronaut on the front, this highly collectible Zippo lighter is limited to only 250 pieces in the UK (14000 worldwide) and comes in a special presentation giftbox. The 2019 Zippo Collectible of the Year is here! - To celebrate the 50th Anniversary of the Moon landing of Apollo 11 in 1969, Zippo have released this Limited Edition individually numbered Armor Zippo lighter. 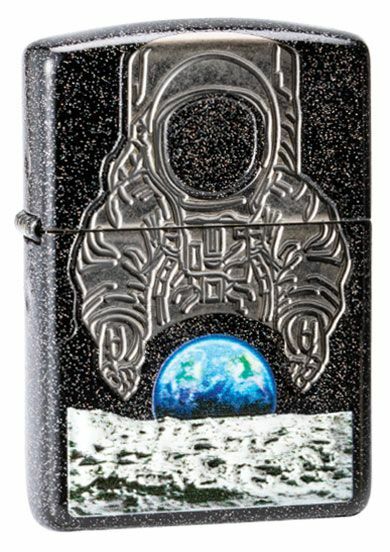 Finished in a unique sparkly Galaxy Stardust finish and featuring a deep carved Astronaut on the front, this highly collectible Zippo lighter is limited to only 250 pieces in the UK (14000 worldwide) and comes in a special presentation giftbox.